Sales tax added for Arkansas residents only. 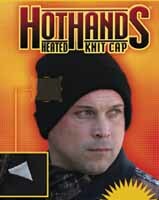 This knitted watch cap comes with a pair of Hot Hands-2 to provide warmth for your head and ears. Perfect for football games, hunting, skiing and any other type of outdoor activity. Sales tax added for Arkansas residents only. There may be additional shipping charges to locations in Alaska and Hawaii. We will call you with the additional charge for approval before shipping your order. Orders will be shipped within 3-5 business days after receipt. 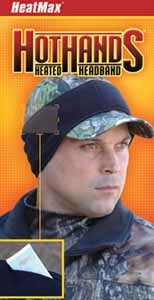 Heated Headband - Keep your head and ears WARM this winter! Available only in camo (not shown). The Heated Headband will keep your ears and head warm for up to 10 hours. 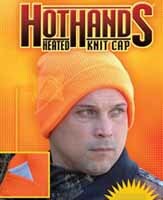 Just slip the included pair of Hot Hands-2 warmers into the special pockets located on the sides of the headband for warm, comfortable hours outdoors. Available only in camo (not shown). One size fits all! The Hand/Back Warming Belt is worn around the waist. 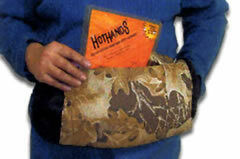 After inserting a Hothands warmer, position pouch in the front to warm your hands. OR, when hands-free warmth is desired, slide the pouch to your back for continuous body warming heat. Includes one pair of Hothands-2. Available in camo pattern. 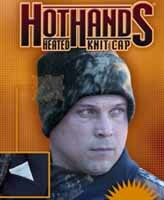 Keeps Buck Gardner warm on his hunting trips! Heated Mittens will keep your hands warm, yet allow you to free your fingers for use when needed. Outershell folds back and fastens securely with Velcro when you need to use your hands. Mittens hold a Hothands-2 each to provide up to 10 hours of warming. Includes one pair of Hothands-2. Available in Camo, sizes Medium/Large and X-Large. Never have cold feet again! Slip a Heatmax Air Activated Foot Warm-up inside of the specially designed pocket on the Feet Heat Socks and enjoy soothing heat that lasts for hours! True Heel & Toe Sock. Available in sizes 9-11 and 10-13. Select size below.